Glacier National Park - Take a Hike! Glacier National Park is a national park is northwest Montana in Flathead and Glacier Counties. The park lies along the US-Canadian border, and along with Waterton Lakes National Park in Alberta, is part of the Waterton-Glacier International Peace Park. Apikuni Falls is a 1-mile (one way) trail that leads to its namesake waterfall. The trailhead is located along Glacier Route 2 in the Many Glacier region of the park, about 3 miles west of the entrance. You can almost see the waterfall from the trailhead, nestled in between Altyn Peak and Apikuni Mountain. The trail is fairly short, but rather steep, gaining over 600 vertical feet in just under a mile. The trail follows Apikuni Creek upstream to the waterfall and there are several spots to get off the trail to view the creek. As you get closer to the end, the waterfall will come into view. The trail ends a short ways before the falls. However, you can pretty easily climb and scramble over the rocks to get right up to the base of the waterfall. Avalanche Lake Trail is a 2-mile (one way) trail that leads from Trail of the Cedars to Avalanche Lake. The trailhead is at Trail of the Cedars by Avalanche Creek Campground. Trail of the Cedars is a loop so follow this trail either way to the start of Avalanche Lake Trail at the far end of the loop. The trail follows Avalanche Creek upstream and the first part of the trail passes a narrow gorge with a small waterfall. I think this is the most scenic part of the trail. After this narrow gorge, the river bed widens and the trail continues to follow it upstream. In about a mile, the trail is far enough away that the creek is no longer visible. In about 1.5 miles from the start, the trail passes the confluence of Hidden Creek and Avalanche Creek. There were a number of downed trees here when we visited. In about another half-mile, the trail ends at Avalanche Lake. Across the lake, several tall waterfalls, including Monument Falls, can be seen flowing down into the lake. Grinnell Glacier is a 5.5 mile trail leading to its namesake glacier. The hike is extremely scenic; my favorite one in the park. The trailhead is located in the Many Glacier area of the park, right past Swiftcurrent Lake and Many Glacier Hotel. The trail starts off flat, running along the western shore of Swiftcurrent Lake. The Many Glacier Hotel is visible across the lake. Once past Swiftcurrent Lake, you'll begin hiking along the western shore of Lake Josephine. The trail is still flat here and you can see some waterfalls tumbling down across the lake. Once past Lake Josephine, the trail starts to get steep as you hike up along the northern shore of Grinnell Lake. Grinnell Lake is a most beautiful turquoise color that is caused by silt and rock flour carried by glacial meltwater. At the far end of the lake, the 1000-foot Grinnell Falls tumbles down into the lake. For the next mile or so, you'll hike past this beautiful lake and waterfall. The trail is somewhat steep, but there are plenty of spots to rest, take some pictures, and enjoy the view. As you get to the end of Grinnell Lake, there are several switchbacks to climb up to the top of Grinnell Falls. Looking back, you can see several of the lakes in the Many Glacier area. Past here, the trail hugs a narrow cliff face and comes out at an flat area, where there is a privy toilet. After a couple more switchbacks, the trail reaches the end where there are wonderful views of Grinnell Glacier, Upper Grinnell Lake, The Salamander Glacier, and Salamander Falls. Iceberg Lake Trail is a 5-mile (one way) trail that leads from Many Glacier to Iceberg Lake. The trailhead is located past the cabins behind Swiftcurrent Motor Inn. From here, the trail head up and then follows a contour as it heads northwest. There are nice views of Mount Grinnell and Mount Wilbur from this section of the trail. In about 2.5 miles, the trail passes Ptarmigan Falls, though there is no good viewing spot for the waterfall from the trail. Cross the creek above the falls and shortly there will be a split. The right split is Ptarmigan Trail; go straight to continue on Iceberg Lake Trail. The trail continues following Iceberg Creek upstream and you have great views of the Iceberg Cirque as you start getting closer. Soon, you'll pass the unnamed lower lake and cross through an area with beautiful wildflower meadows. Right past here, the trail will end at the shore of Iceberg Lake. Ptarmigan Trail is a long-distance trail running from the Many Glacier area to Belly River Ranger Station. I've only hiked this trail as far as Ptarmigan Tunnel, about 5 miles from the trailhead at Many Glacier. The trailhead for Ptarmigan Trail is the same as for Iceberg Lake Trail above - the cabins behind Swiftcurrent Motor Inn. Follow the combined trail for about 2.5 miles, passing Ptarmigan Falls, to the split. Go right to stay on Ptarmigan Trail. The trail heads up as it follows Ptarmigan Creek upstream. There's not a lot trees in this section so the wildflowers are great. In about 2 miles from the split, you'll reach Ptarmigan Lake. From the lake, the trail gets rather steep as it heads up to Ptarmigan Tunnel. After a couple of switchbacks, you'll reach the tunnel. On the other side, there are nice views of Elizabeth Lake and Old Sun Glacier. This is as far as I've made it on the trail. Akaiyan Falls is a tall waterfall on a tributary of Sprague Creek. To visit the falls, get on the Gunsight Pass Trail at McDonald Lodge and hike towards Sperry Chalet. In about 6 miles, shortly before reaching the chalet, Akaiyan Falls is visible across Glacier Basin. You can take the Sperry Lake Trail from near Sperry Chalet to get closer to the falls, but we didn't have time when we were here, so only could view from a distance. Apikuni Falls is a beautiful 150-foot waterfall on Apikuni Creek. 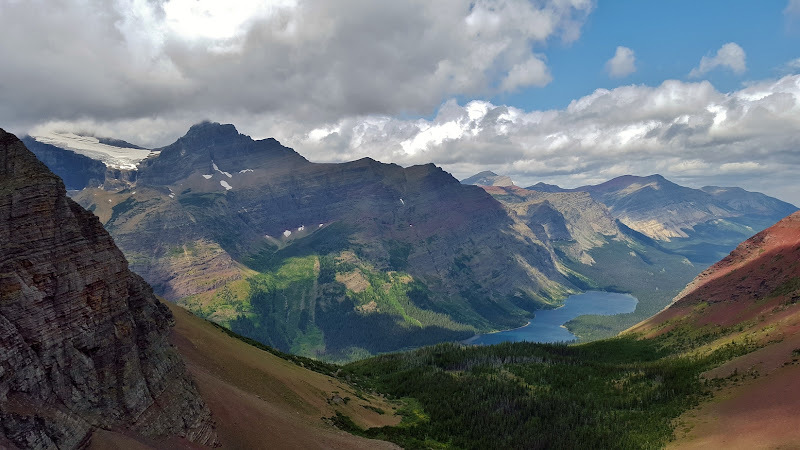 To visit the falls, head into the park at Many Glacier and go to the Apikuni Falls Trailhead parking, just past Lake Sherburne and before the Grinnell Glacier Trailhead parking. Hike Apikuni Falls Trail for just under a mile to the beautiful waterfall. Aster Falls is a waterfall on Aster Creek in the Two Medicine area of the park. To visit the falls, park at the Two Medicine Lake Boating area and hike the Two Medicine South Shore Trail. In just over a mile, turn left on Aster Park Trail and go about 0.1 miles to the waterfall. Waterfall on Avalanche Creek is a waterfall in the Avalanche Creek Gorge. To visit the falls, head to the Avalanche Creek Campground area. Begin hiking the short Trail of the Cedars and get on Avalanche Lake Trail. As soon as you get on this trail, head over to the creek to find the waterfall. The water runs through a narrow gorge of cool rocks sculpted by the flowing water. Beaver Medicine Falls is a 100-foot waterfall on Sprague Creek. To visit the falls, get on the Gunsight Pass Trail at McDonald Lodge and hike towards Sperry Chalet. In about 4.5 miles, you can see the falls off to the right of the trail. I tried to bushwhack around, but was unable to find a good viewing spot. As such, I don't think this one is worth the hike just for the waterfall, but its on the way to Sperry Chalet and worth a quick stop if you're making that hike. Bird Woman Falls is a nearly 500-foot waterfall, one of the tallest in the park. I don't believe there's a way to hike to the waterfall, but you can see it from a distance along Going-to-the-Sun Road. Getting on Going-to-the-Sun Road at Apgar Village, it's about 25 miles to the Bird Woman Falls Overlook. You can view from the waterfall from about 2 miles from this overlook. Feather Woman Falls is a tall waterfall on a tributary of Sprague Creek. To visit the falls, get on the Gunsight Pass Trail at McDonald Lodge and hike towards Sperry Chalet. In about 6 miles, shortly before reaching the chalet, Feather Woman Falls is visible across Glacier Basin. You can take the Sperry Lake Trail from near Sperry Chalet to get closer to the falls, but we didn't have time when we were here, so only could view from a distance. We visited in late summer when the water level was low and the waterfall has two distinct streams. I think that in higher water level it has several more streams tumbling down the mountain. Grinnell Falls is a huge waterfall on Grinnell Creek between Upper and Lower Grinnell Lakes. To visit the falls, head into the park at the Many Glacier entrance and proceed to the large Grinnell Glacier Trailhead parking lot on the left after passing Lake Sherburne. From here, hike the Grinnell Glacier Trail. After passing Swiftcurrent Lake and Lake Josephine, the trail will head up to a ridgeline over Grinnell Lake. You can see the waterfall at the far end of the lake for the next couple of miles of the trail, but I don't think there's a way to get closer. Haystack Falls is a tall waterfall on Haystack Creek, right next to Going-to-the-Sun Road. Getting on Going-to-the-Sun Road at Apgar Village, it's about 25 miles to the Bird Woman Falls Overlook. Haystack Falls tumbles down the mountain with Going-to-the-Sun Road crossing over the falls just past the overlook. McDonald Falls is a waterfall on McDonald Creek, just upstream from where the creek flows into Lake McDonald. To visit the falls, head towards Lake McDonald on Going-to-the-Sun Road. Just past the lake, turn left on North Lake McDonald Road, cross the bridge, and park at the small lot on the right. From here, hike a short ways along the McDonald Creek Trail to the waterfall. You'll have to climb down the rocks to get to the base for the best views of the falls. Monument Falls is one of several very tall waterfalls flowing down into Avalanche Lake. It's the only one named on the topo map. To visit the falls, head to the Avalanche Creek Campground area. Begin hiking the short Trail of the Cedars and get on Avalanche Lake Trail. Follow this trail for about 2 miles to the end at Avalanche Lake. Looking across the lake, you can see several waterfalls flowing down. I believe that Monument Falls is the one furthest to the left in the picture below. Oberlin Falls is a roadside waterfall on Logan Creek near Logan Pass. From the Logan Pass visitor center, drive west on Going-to-the-Sun Road a short ways to the Oberlin Bend overlook and then walk a short ways back up the road to the waterfall. Ptarmigan Falls is a waterfall on Ptarmigan Creek, accessed from the Many Glacier area of the park. To visit the falls, follow the Ptarmigan/Iceberg Lake Trail, which starts from the cabins behind Swiftcurrent Motor Inn. It's about 2.5 miles from the trailhead to the waterfall. Unfortunately, there isn't really a good view of the waterfall from the trail and it's extremely difficult to get to a position for a decent photo as in the one below. Rockwell Falls is a waterfall in several sections on a tributary of Paradise Creek. To visit the falls, park at the Two Medicine Lake Boating area and hike the Two Medicine South Shore Trail. In 2.5 miles, turn left on Two Medicine Pass Trail and go 1.2 miles to the waterfall. From the base you can only see the lowest section. If you cross the creek at the base, you can climb up and find several more sections of this waterfall. Continuing up further, it seems that this waterfall just keeps going! Running Eagle Falls, also called Trick Falls, is a very unique waterfall on Two Medicine Creek. To visit the falls, head into the park at the Two Medicine entrance and park at the Running Eagle Falls Nature Trailhead parking, about 2 miles before the boating area. From here, follow the short, handicapped-accessible trail to a viewing platform. You can climb out on the rocks to get a closer view. This is a really interesting waterfall. The creek falls into a sinkhole and comes out of the side of the cliff. The water appears to be coming from nowhere. We visited during a period of low water, but when the water is higher, there is a second waterfall that comes down from the top of the cliff. Salamander Falls is a tall waterfall fed by the glacial melt from The Salamander Glacier. To visit the falls, head into the park at the Many Glacier entrance and proceed to the large Grinnell Glacier Trailhead parking lot on the left after passing Lake Sherburne. From here, hike the Grinnell Glacier Trail to the end at Grinnell Glacier and Upper Grinnell Lake. Salamander Falls is visible across the lake, tumbling down from The Salamander Glacier. Waterfall on Snyder Creek is a small waterfall along Gunsight Pass Trail. To visit the falls, get on the Gunsight Pass Trail at McDonald Lodge and hike towards Sperry Chalet. In about 2 miles, pass the intersection with Snyder Lake Trail and cross Snyder Creek on a footbridge. Shortly after the bridge, you should be able to hear the waterfall on the creek below. Bushwhack down to the creek for a view of the waterfall. Twin Falls is a double waterfall on a tributary of Two Medicine Creek. To visit the falls, park at the Two Medicine Lake Boating area. You can either hike the Two Medicine South Shore Trail or take a boat ridge across the lake (for a fee). The South Shore Trail leads to the boat dock on the other side of the lake in about 3.5 miles. Past the boat dock, turn left on Upper Two Medicine Trail and a spur to the falls will be on the right in less than a quarter-mile. The tributary splits into two streams above the waterfall, making two distinct falls that come together again downstream. Goat Lick Overlook is an overlook south of the park off US-2 with views of an exposed riverbed with a high concentration of minerals. Wild animals, especially mountain goats, are attracted to the area to lick salt off the cliffs. Fortunately, the Park Service has constructed fences and bridges to allow the goats and other animals to cross under the highway and reduce the risk of collisions. The best time to see goats is in the early morning or alte evening. Bring binoculars or a telephoto lens as the goats are very far away from the overlook.